There are times when my motto ‘life is too short not to eat well’ is honoured more in the breach than the observance – like when I’m in the middle of an exam period, when food is more about fuel and speed than pleasure. Still, there are some ways around that. 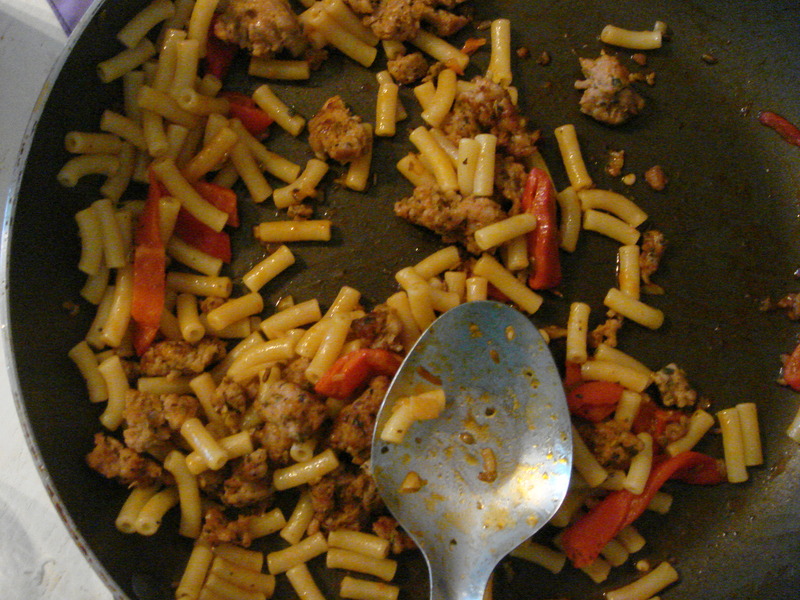 For the following dish, roasted pepper and sausage pasta, I used roasted red peppers from a jar instead of roasting the peppers myself, cutting down on preparation time. I use the Bevelini brand of peppers, which I can buy from a local shop, but roasted peppers are sold in all the big supermarkets as well (maybe not the same brand). The peppers were preserved in vinegar, so I rinsed them twice: once upon removing from the jar and once after slicing, to get rid of as much of the acid as possible. The jarred peppers can be smaller than the ones you roast yourself so consider adding an extra jarred pepper or two. Finally, using jarred peppers means losing some of the dish’s smoky elements, so considering adding a pinch or two of smoked paprika to the spiced sausage mix with the other spices. The original recipe is even simpler than this, requiring simply that you squeeze out some sweet Italian sausages. Since I can’t find those easily in the UK I just use regular pork sausages and add a spice and garlic blend based on the ingredients lists of American Italian sausages. Please note that the spice blend tastes quite strongly and distinctively of fennel, so adjust that if you prefer. Next Next post: TIPS: run out of yoghurt?